This car burst into flames when it got wedged beneath a tractor-trailer truck traveling north on Interstate 95 in Fairfield early Sunday. A 27-year-old Bridgeport woman died in a fiery crash early Sunday when her car became wedged under a tractor-trailer truck and burst into flames on Interstate 95 near the local northbound rest stop. Yvonne Sokol was pronounced dead at the scene following the 6:30 a.m. accident near Exit 22 northbound, according to State Police. Sokol was driving at a high rate of speed and swerving in and out of the highway's left and center lanes, police said. As she veered right, she struck the rear of the tractor-trailer truck, police said. The car burst into flames and became wedged under the truck driven by Brian Quinn, 50, of Dedham Mass., who police said was not injured in the crash. 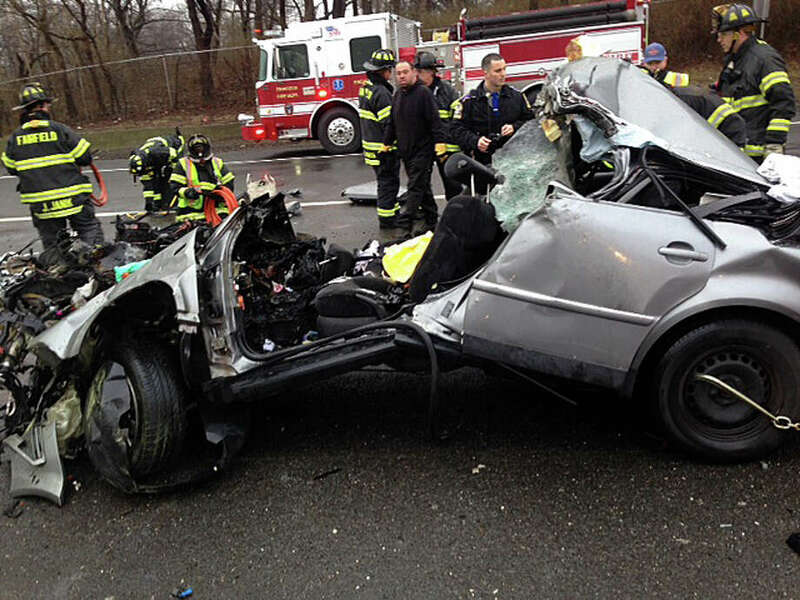 Sokol, the car's only occupant, had no pulse when firefighters arrived at the scene. The woman was trapped in the mangled wreck beneath the tractor-trailer, according to a statement by Assistant Fire Chief Schuyler Sherwood. Engine trucks 1 and 2, Ladder trucks 1 and 2, and Car 3 were all dispatched to the scene. They were later assisted by Engine 4 and a crew of Westport firefighters. After extinguishing the fire, operations to lift the truck's trailer off the car were started. Twenty-four emergency services personnel, along with a heavy-duty wrecker, were involved in hoisting the trailer and extricating the woman from the car. The woman's body was taken to an area hospital by an American Medical Response ambulance. Firefighters remained on the scene until about 8:30 a.m. Sunday.